Welcome to the INGOMA PLANET web page. It is created by our organization for all people who are interested to know about african cultural dances and music. African dance (music) is not just a performance, it is a spiritual energy, a way to explore our minds and express our african life. The african dance is a deep, emotional and rhythmic spiritual healing. Live on INGOMA PLANET concert, you will not only see but you will feel that special healing energy. 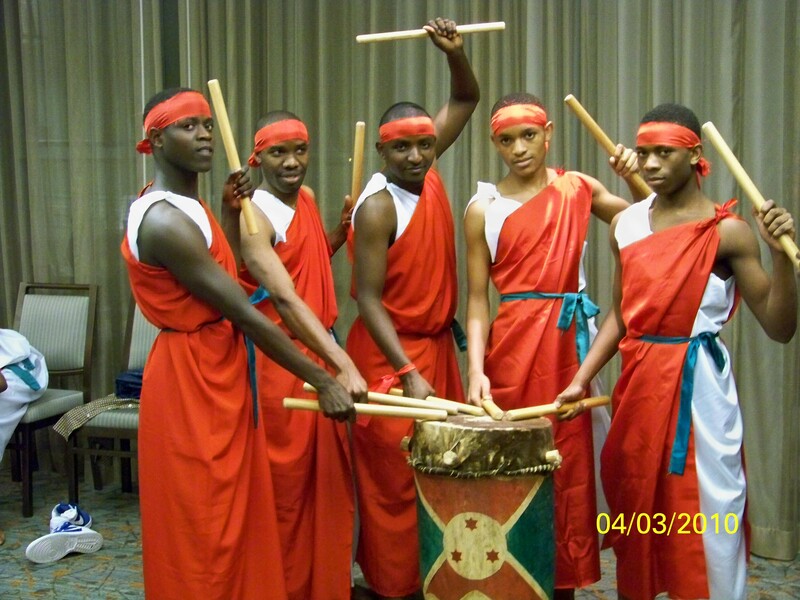 INGOMA PLANET is composed of Masters Drummers originally from Burundi ( The heart of Africa); Warriors Dancers-Intore from the african great lakes region and the most exciting and inspiring African Women Dance. Considered one of the best percussion ensemble on the planet, The masters drummers from Burundi's performance is as much about the spectacle as it is about music. Full of energy, grace and pure athletism, the 12-strong troupe , traditionally dressed in colorful robes, hammer out compelling rhythms and complex syncopations whilst leaping, dancing, singing or even fighting imaginary foes over their drums. During the perfomance the drummers rotate, playing different instruments and creating a mesmering and continious stream of music, rhythm and dance. In Burundi the privilege of playing drumms was handed from father to son for generations, but today we are giving drumming lessons here in Houston, Texas. Intore dancers have gained a worldwide status of fame and have become an indispensable part of the african cultural and traditional ballet.The Intore dancers move sideways combining difficult choreography and grace with a raw aggressiveness in their expressions. At one point, the dancers stop, with stretched arms and give out blood-curdling battle cries.This form of traditional Rwanda and Burundi ballet is one of the ancient forms of dancing in Africa. The Intore dancing is also known as “ Warriors Dancing"